I am a beginner and I have a very elementary question, but I don't know where to find the answer! I am downloading the CRSP monthly stock files for 20 years. I want to have only AMEX and NYSE stocks. But I think CRSP has all stocks including NASDAQ. How can I keep only NYSE and AMEX and delete any other markets from the data? Is there any indicator which shows which stock is traded in which market? 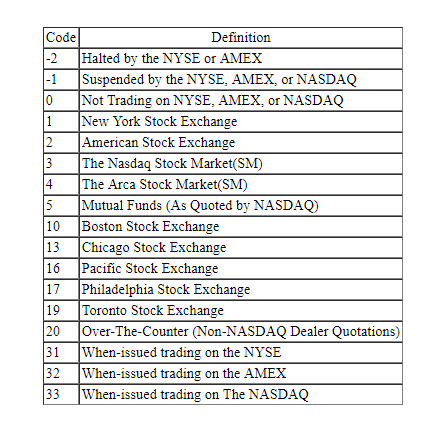 So if you keep only the stocks with codes 1 and 2 you should be good to go. Not the answer you're looking for? Browse other questions tagged equities market-data market or ask your own question.